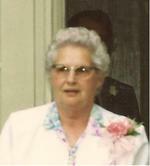 Wadna A. Shafer, 93 of Ashland passed away on Monday July 9, 2012 at Samaritan Regional Health System. Wadna was born on April 1, 1919 in Monroe County to Forrest and Mary (English) Nalley and was a graduate of Woodsfield High School Class of 1937. Wadna married Raymond W. Shafer on June 21, 1939 in Woodsfield, Ohio. Shortly thereafter the couple moved to Ashland to start Raymond’s business and raise a family. Mrs. Shafer was a member of the First United Methodist Church of Ashland, and a member of the Emblem Club of Ashland. Wadna was a Domestic Goddess taking care of her mother and family. She also supported her husband in his Insurance business for many years. She loved playing Bingo, cooking and watching the Cleveland Indians play baseball. Surviving are three sons. Forrest W. (Bill) and Judy Shafer of Ashland, Robert L. Shafer (Joyce Jenney) of Ashland and Phillip R. and Ruth Shafer of Ashland. Seven grandchildren and nine great grandchildren also survive. Wadna was preceded in death by her husband of 56 years, Raymond W. Shafer, brother Harry Nalley and her parents, Forrest and Mary Nalley. Funeral services will be held at the Heyl Funeral Home on Thursday July 12, 2012 at 11:00 a.m. with Pastor Gary Hunt officiating. Burial will follow the funeral service at the Ashland County Memorial Park. Friends may visit with the family on Wednesday July 11, 2012 from 5-7 p.m. at the funeral home.